Farmer Producer Organization is formed with the main objective of socio economic development of farmers through productivity improvement, cost reduction, efficient aggregation, processing for value addition, better by-product utilization and efficient marketing of the produce. It aims at providing a fair, steady and reasonable income to farmers by organizing the unorganized coconut sector through farmer collectives. True empowerment happens only when farmers are involved in all stages of value addition supply chain, such as, production, aggregation, processing, marketing, distribution and sales. Only when farmers starts an enterprise of their own, they will learn to plan, collaborate, work in a team, take decisions and risks, interact with people from other spheres and sectors, thus learning and growing with the enterprise. This helps in inducing self confidence within the farmers thus enabling their overall development. The name ‘Producer Company’ is provided in order to indicate that the members have to necessarily be a primary producer. A new Part IXA, sections 581(A) to 581(ZT) of Indian Companies Act 1956 provide the features of a Producer Company. It is a hybrid between a Private limited Company and a Cooperative society as it minimizes interference from other external bodies thus ensuring that the real power rests with members of the company itself. Such a company functions like any other private limited company with only difference being that the profit incurred flows back to farmers who own the company. The Coconut Farmers Producer Organizations thus formed have a three tier structure consisting of Coconut Producers Society (CPS), Coconut Producers Federation (CPF) and Coconut Producers Company (CPC). CPS is formed by associating 40-100 coconut growers in a contiguous area with range of 4000-6000 yielding palms. Farmers with a minimum of 10 palms are only eligible to be a part of this society. 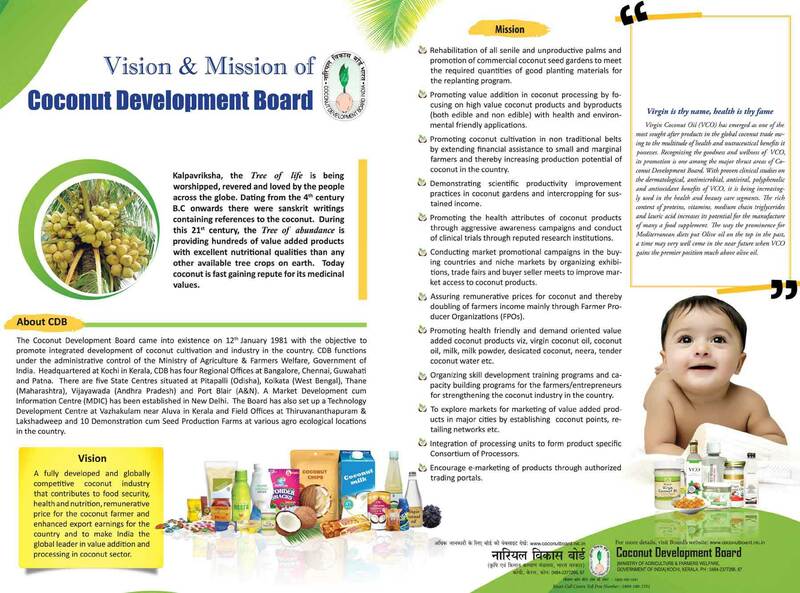 Once the society is formed, it is registered under charitable societies act and also with Coconut Development Board. All the societies have a common bye - law. CPF is formed by combining 8-10 CPS. A CPF would have around 1,00,000 palms under it. CPF is also registered as a charitable society and further registered with CDB. 8-10 CPFs would join together to form a CPC. A CPC would consist of around 10,00,000 yielding palms. This company would be registered under section 581B of Indian Companies Act of 1956. The Producer Company is wholly and fully owned by the farmers.